Creating an aspirational event as part of a dealer engagement strategy for retained client Quooker led us into a kitchen for an exclusive cookery demonstration with chef John Torode. 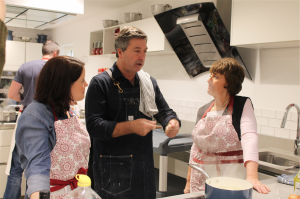 The Astute team conceived, developed and managed delivery of the event in which groups of dealers from the UK and Ireland were invited to a half-day Christmas-themed cookery class with John Torode. Held at London’s Good Housekeeping Institute, which is fully-equipped with Quooker taps, the event consisted of two sessions, one in the morning and one in the afternoon. In addition, the event provided content for use across Quooker’s social platforms and as the basis of media outreach to key trade titles. The client declared it to be “a great day, well organised and most enjoyable”. See coverage placed by the Astute team on KBBDaily.